GOSHEN, N.Y. (March 29, 2018) – On Wednesday, March 28, Glen Arden residents Marty and Esther Schwager celebrated their 75th wedding anniversary. The couple has resided at Glen Arden since 2011. “I told him, ‘you’re crazy,’” said Esther recently, conceding with a smile that it turned out they were both right. Marty and Esther, barely out of their teens in 1941, were on a date in a Manhattan deli when news of Pearl Harbor came on the radio. Marty enlisted and was to head overseas as an infantryman after training. But, not before he wed the love of his life. Marty proposed and the couple wed, with Marty in full uniform, in a simple ceremony on March 28, 1943. He shipped out not long after. When Marty returned safely, the Schwagers moved to the Bronx and had three children. Marty worked at the Post Office before eventually landing a job in the court system. Esther stayed home and raised the kids, the couple upgrading apartment sizes as they could. Esther says that through good and “the not so good,” the couple has kept on doing everything hand in hand. The couple settled into Westchester County by the time their children had grown and in the 70s embraced healthy lifestyle habits, including jogging, that they both attribute for their longevity. Marty and Esther retired in their 60s and stayed active with volunteer work, mentoring high school students and helping out with several charities. Again, always hand in hand. 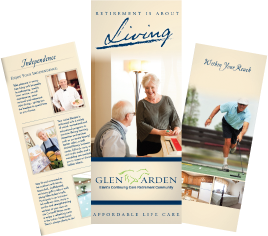 Since moving into Glen Arden, the Schwagers have enjoyed frequent visits from their children and seven grandkids. Everyone at Glen Arden wishes Marty and Esther Schwager a very happy anniversary.